The Burnout series once again returns on the XBox and Criterion continues to push the bar higher and higher and with their latest release, Burnout Revenge is probably the best racing game out in 2005. Unlike the previous title which suffered some flack from certain reviews, the gameplay of Revenge has been drastically modified and to quote an old saying, "revenge is a dish best served cold" which is what this new current incarnation of Burnout is all about. Criterion listened to the criticisms of the previous title and created one of the most addictive and highly entertaining games of the year. 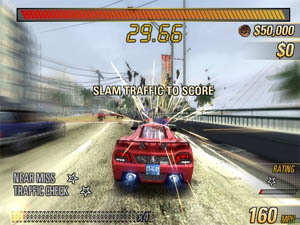 Unlike Burnout 3, Revenge takes the pain and heartache out of crashing because it's now used as a tactical strategy that allows the gamer to push their opponents into oncoming traffic but the beauty of the game is that traffic no longer causes you to crash, unless you've been pushed into it. This is great news for gamers because not only does it improve the gameplay but also the longevity. 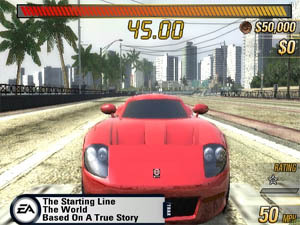 With that said, Burnout Revenge also features a variety of different gameplay modes and also some great online content. The new gameplay of Revenge stars all opponents with blue marks over them, indicating that they are neutral. If you continue to target a particular opponent during a race they will become increasingly more aggressive towards you, ultimately turning that blue marker into red, which means they're completely gunning for you. If you manage to take down any of the competition that is red marked for Revenge, you'll earn a Revenge Takedown which will crank up the points in your Revenge Meter and put you that much closer to taking the big prize. 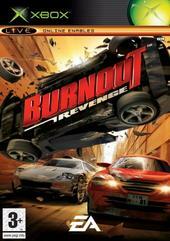 As with previous titles, you'll play Burnout Revenge main event to unlock new tracks, cars and also new modes of play. New arrivals alongside the tried and true Road Rage and Crash challenges include Traffic Attack and the Crashbreaker mode. Traffic Attack is exactly what it sounds like - pile on the hurt while Crashbreaker is something entirely new. Revenge is probably the best looking and sounding in the series and is a contender for the best looking racer ever. The game moves so fast and looks so incredible at high speeds that other development teams really need to sit up and take notice. Revenge's car models return to Burnout 2's roster of cool Criterion based machines rather than caricatures of real world vehicles. It doesn't really make a lot of difference in the scheme of things and you'll either dig it, not dig it or not care one way or the other. Burnout 2 fans who found last years game too much of a shock to the system might delight in the direction Revenge takes this year. In any event you can't say that Criterion was resting on it's laurels. Any gamer who gets off on high speed hijinks will find that Revenge is a dish best served now!